Can a person’s life change in just 30 seconds? Can a person who has been buried in pain for seven long years find a way to move on…to live life fully after being held down by fear, regret, and guilt for an abundance of time? Can a man who is used to getting what he wants by simply being himself put the effort in to get beneath a woman’s perfectly constructed mask and see her for more than just a sexual release? Can two broken people wake one another up and prove to each other that their ‘more’ doesn’t have to cripple them or keep them at arm’s length from everyone? 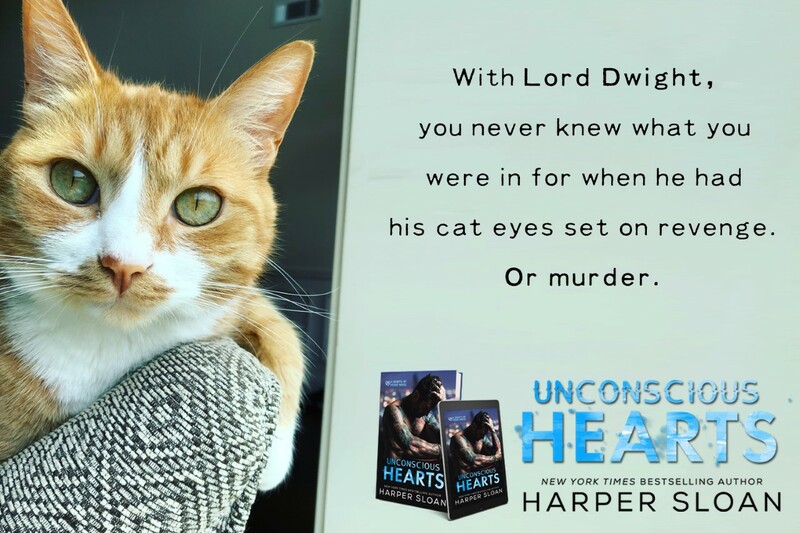 Harper Sloan goes back to her writing roots in her new Hearts of Vegas series; Unconscious Hearts brings the steam, drama, and suspense that fans of Sloan have come to adore about her storytelling, and Ari Daniels and Thorn Evans are two dynamic main characters who find everything they never knew they wanted and needed in one another. Ari is definitely my kind of heroine. She’s been through hell, but she still endures…she still gets through the day, and even though she’s sometimes crippled by the memories of what’s been done to her, stuck in the aftermath of other people’s words and deeds, with a little push from her best friend and some soul searching, she takes the risk to open her heart again, hoping against hope that Thorn Evans will not break her heart but rather free it from the prison it’s been in for the past 7 years. Thorn is an alpha male to his core, and while sometimes, his actions and behavior is over the top, there are reasons behind his overbearing and arrogant ways. He brings Ari back to life; he helps her to heal…to see herself as the beautiful person that she is. He gives her back her life…her desire…her confidence, and each and every day, Thorn proves just how special she is to him and how she can count on his love and his devotion to her. I loved witnessing Ari and Thorn’s journey – one that began with an instant attraction and a 30 second bet that categorically changed both of their lives for the better. The insights readers receive as Ari and Thorn define and redefine their relationship allows us to understand what’s at stake for both of them and why they’re willing to take a risk with each other when they’ve never wanted to in the past. The things that this couple must encounter are not easy, but the fact that they hold steadfast to one another speaks to what they’re building and how everything is different now that they’ve found each other, which makes the fact that they’re fighters all the more important for what they’re confronted with through Unconscious Hearts. I can’t write a review of this book without mentioning the secondary characters and their influence and effect on Ari and Thorn. Ari’s best friend, Piper, and Wilder, a man who has been by Thorn’s side since they were young play pivotal roles in Ari and Thorn’s lives. These two people are instrumental in forcing their best friends to face their pasts in order to see and understand that their futures don’t have to be anything like their lives have been, and it’s Piper’s constancy at Ari’s side…Piper’s ability to be honest with her long-time friend and push Ari to confront her heartbreak and stop using it as a crutch to remain in neutral when it comes to moving forward and finally living again. Unconscious Hearts is told from both Ari and Thorn’s perspectives, so readers get their backstories, their truths, their honest feelings firsthand, which is necessary in order to understand the choices these two have made and what seems to be holding them back from love and from life. I can’t wait for book two in Harper Sloan’s Las Vegas Hearts series, and I’m hoping that Piper and Wilder’s story is up next because those two have been dancing around each other since their first encounter, and while I know there are obstacles standing in their way, they both deserve happiness, which I think they can find in one another!